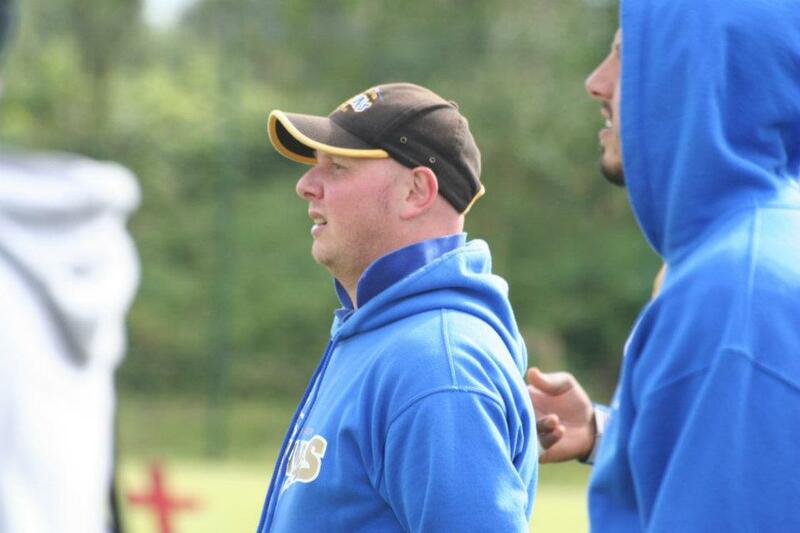 The Manchester Titans travelled up to Scotland to take on the unbeaten Edinburgh Wolves and came away with a nail-biting 16-14 victory. In a game where the defence repeatedly came up with goal line stands and turnovers, the Titans move to 3-1 and sit in 2nd place in the Premier North. In what was a low scoring game, it was a combination of the Titans defence and clutch special teams play that secured the victory for the Big Blue. Both teams offenses stalled in the first quarter, the Titans secondary set the tone for a shut down day with Ryan Allen and Stuart Robinson making early plays. The Titans offense has Axel Falempin starting at running back, in place of the missing Joe Nicholson and despite good running, and QB Bloomfield connecting with receivers George Slade, Luc Kinder and Adam Bamber, each drive stalled just out of field goal range forcing the Titans to punt. 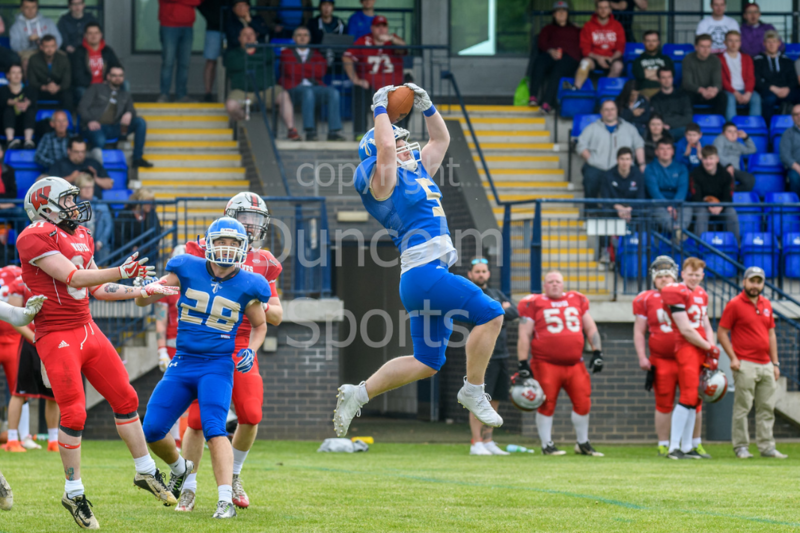 The 1st quarter ended with the Titans in good field position, an interception by Dave Barnett give the Titans the ball at hallway, having moved the ball to the Edinburgh 30 a fumbled pitch saw the Wolves recover and move the ball into Titans territory. Into the 2nd quarter and a pass to their tight-end gave Edinburgh 1st and goal but in what has been a theme for the Titans, they stood up the Wolves offense three times, the Titans Dline of Mzengereza, Makin, Todd and Bainbridge, playing out of position, not allowing any yardage up the middle. On 4th down the Wolves went for the short field goal but excellent pressure from the Titans special teams unit forced the kick to be pulled crucially wide. This signalled a period of intense pressure from the Wolves, the Titans went 3 and out and punted from their own endzone, starting at halfway Edinburgh moved the ball into a 1st and goal situation again but crucial goaline tackles from Chase Johnston, Jack Hipperson and Lee Horrocks kept the Wolf Pack out, when forced to pass on 3rd down ex U19 Johnston came up with another pick – getting his name on the Titans plank again – to keep the score tied at 0-0. The Titans moved the chains but ultimately had to punt from their own 20 yard line, with good field position again Edinburgh this time found a way through the resolute Titans defense. A 12 play drive, including another 3 on the goal line eventually found its way into the endzone to give the Wolves a 7-0 lead. After the kick off the Titans stalled again but a booming 76 yard punt from Luc Kinder combined with a huge effort from the Titans front line pinned the Wolves inside their own 10 yard line. The Wolves looked to move the ball but again Johnston came up with a one way ticket to pick city, giving the Titans the ball back at halfway with less than 30 seconds left in the half. Bloomfield led his team 50 yards in 3 plays, first he found Kinder up the seam before a clutch catch under pressure from Slade took the Titans inside the 20. Then, as time expired a pump action helped Kinder get a yard of space and Bloomfield put the ball where only his wiry receiver could catch it. With plenty to do Kinder made a toe grabbing sideline catch and the Titans levelled at 7-7 at half time after kick squad duo of Aaron Bowcott and Rick Hughes added the XP. The Titans received the kick off in the second half and set about gaining some offensive momentum, Bloomfield moved the chains with passed to Bamber and a large gain to Slade but it was the power running of mini-Hercules Falempin who bowled his way through the middle on a series of short but effective inside runs as the Titans drove the field. Faced with 12 yards to go, Bloomfield showed his accuracy with a pinpoint pass to Slade for his first TD of the season. The XP was blocked, but Titans had turned the game around to lead 13-7. The Wolves came straight back, putting together a 15 play drive to move the ball to the Titans 7, but when the crunch came the Big Blue Wrecking Crew stood up again, Allen with a broken up pass before safeties Robinson and Barnett blitzed to sack the Wolves QB for a big loss. On 3rd down, great D-line pressure caused the QB to scramble and throw under pressure and just miss the receiver out the side of the endzone. For the second time in the game the Wolves had a short field goal and for the second time Titans special teams came out on top, this time Bainbridge gave the field goal the thumbs down, penetrating the middle of the line to get a pivotal block. The Titans went 3 and out but the wiry Luc Kinder channelled his inner Nigel Gruff and spanked a punt from his own 10 yard line to inside the Wolves 5 where the Titans downed the ball to pile the pressure on the Wolves offense. The Titans defense responded and forced a punt which Slade fair caught on the Wolves 45 yard line. 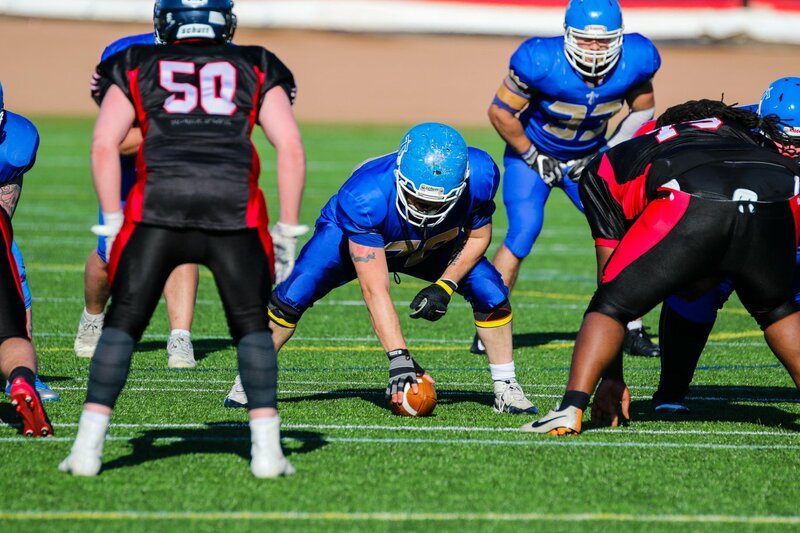 Falempin moved the ball behind his O-line to the Wolves 20 but an untimely fumble gave the Wolves the ball back as we moved into the 4th quarter. 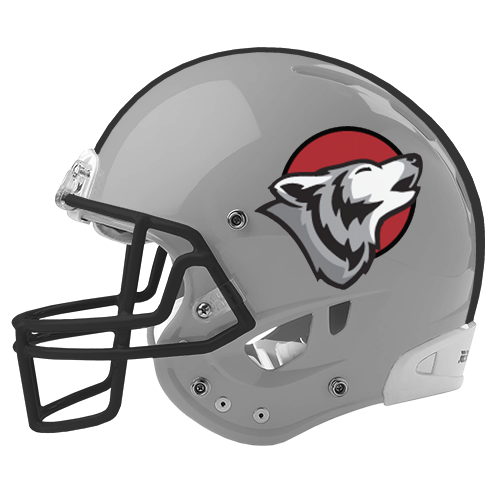 The Wolves, unable to gain any ground were forced to punt but yet again, Coach Stretch’s special teams did the job for the Titans, the punt was blocked and returned by James Allen (Senior) to the Wolves 5 yard line. Despite Bloomfield twice hitting his receivers hands in the endzone, the Titans were unable to take advantage, the Titans field goal unit came into the game on 4th down, Bowcott hitting what was to be a game winning score from the right hash to give the Titans a 16-7 lead. The drama was far from over, after Bowcott put kick off deep, the Wolves hit a 14 play drive to go the length of the field, on goal line football again it looked as if the Titans would get the stop again before a 3rd and short run was stretched out into the endzone for the score, the Wolves moving to within 2 points with less than 5 minutes remaining. Looking to close the game, the Titans could only manage 5 plays before punting, Edinburgh starting on their own 30 yard line, moved the chains once before a crucial tackle on 4th down from Robinson turned the ball over at halfway. Bloomfield and Falempin looked to run the clock out, a series of short gains forced Edinburgh to use all time outs before two big gains moved the ball into the Wolves red zone. With hardly any time left the Wolves were able to strip the ball and recover, Titans O-Line Mike McGougan smothering the return before it could do any damage. On their own 25 yard line with no timeouts and little time the Wolves faced an uphill task, a 1st down pass to half way and quick thinking to get the ball out of bounds kept them alive but with time for only one more play a screen was sniffed out by the Titans and the game was over. The Titans moving to 3 and 1, nerves shredded.